Not everyone in New Jersey can be good in sales; in fact, even fewer can be great at it. 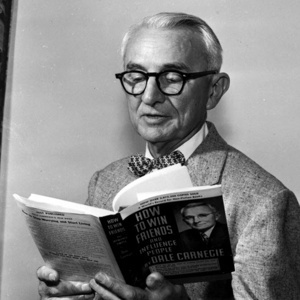 Yet Dale Carnegie stood out and later trained people on his philosophy. He was truly excellent at winning friends and influencing people. So much so it is the name of his first best seller. Enjoyment of the job: If you like, even love what you do, it will be contagious and other people will notice. That excitement will be remembered and even more importantly, people will buy from people who enjoy what they do. Common sense: Keep every activity and interaction simple and straightforward. Listen to the client and provide alternatives for both need and want. Modesty: Not being pushy is a great sales attribute. Selling only happens consistently when people buy. Building referrals through clients: The best advertising comes from satisfied clients. The process of staying in touch with them and NOT selling them something pays off in the long run. Shoot for 50%: Although it is wonderful to think that everyone who buys from a good, honest, and high energy sales professional will buy a second time, that is often wishful thinking. But it is entirely possible, especially in the heart of New Jersey to get half of them to be repeat buyers. Focus on that half. Downturns: Every year the economy takes on a different challenge. Clientele that is loyal and is coupled with positive influence by the salesperson, will be there no natter the economic environment. The Web is a friend not a foe: Welcome clients who are more knowledgeable than you about the products and services; the more information the better will help them make great decisions.